How can health professionals teach diabetes education without getting sucked into the restrictive-eating, appearance-based, weight-loss trap? Diabetes Counseling and Education Activities: Helping clients without harping on weight, is the culmination of 20 years of teaching experience by a Certified Diabetes Educator, Registered Dietitian, and Mindful Eating pioneer. Help clients without harping on weight, so you can help the more than 370 million people worldwide with diabetes move away from the scale and unsustainable restrictive eating patterns to find better glucose control by focusing on size-acceptance, consistent self-care behaviors, and diabetes care. An effective weight-neutral counseling framework when working with diabetes clients–plus practical tips for using it today! Loads of innovative weight-neutral diabetes-oriented activities to use with clients–with handouts included! Learn to use The Insulin Knife, The Liver Sponge, the Blood Sugar Rocket, “What About Weight?” and much more with your diabetes clients. Specific counseling dialogue, learning objectives tips, and visuals accompany each activity, so you’ll feel confident and knowledgeable using each one! 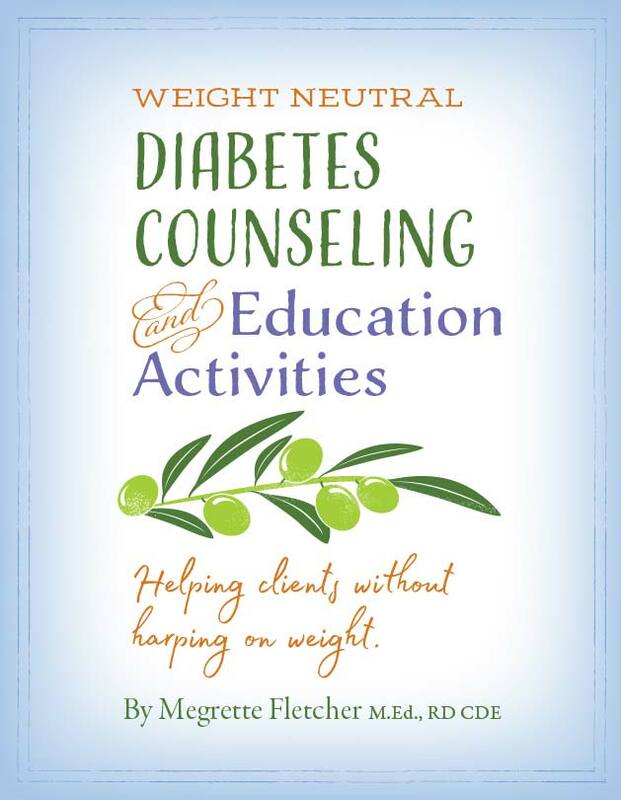 This weight-neutral book offers 14-counseling activities, three handouts, and research explaining why we need to stop focusing on weight for people with type 2 diabetes. The book uses Motivational Interviewing counseling dialog to shift the focus away from restrictive eating and weight to changing behaviors and understanding type 2 diabetes. Embracing a Weight-Neutral Approach to Diabetes Care – This discussion is designed to help you really understand why understanding the Health At Every Size, HAES movement is important for diabetes care. It continues to offer suggestions on how to avoid common counseling pitfalls and it concludes with providing four points for bringing HAES into your MNT/DSMT program. The Insulin Knife: Part 1 – This handout and teaching activity explains the complexity of type 2 diabetes without making it confusing. If you have been looking for a way to talk about insulin production, insulin resistance, and diet without weight loss, then the Insulin Knife will be a perfect activity to learn. This activity breaks type 2 diabetes into three questions, each answer built on the next, providing a whole view of diabetes care. The Insulin Knife: Part 2 – A Deeper look into insulin resistance – This activity build on the Insulin Knife handout. After presenting the Insulin Knife, many clients will have questions and will want to explore one of the three aspects of this concept in greater detail. The Insulin Knife: Part 2 focuses on the different factors that contribute to insulin resistance allowing you to unpack this concept with confidence. Thermostat: Understanding the Cause of Insulin Resistance – This handout and teaching activity explains the role of environment and lifestyle change and how blood sugar levels can shift as a result. Using a thermostat as an example, clients can raise and lower their carbohydrate levels by changing the many variables that contribute to or improve insulin resistance. Blood Sugar Rocket – This activity reviews the role of macronutrients and fiber in the diet. It explains in a simple way why some foods have little effect on blood sugar, while others make them rise? The blood sugar rocket activity explains this concept in an interactive, kinesthetic way. Using this model, you can teach have clients change their rocket’s direction by shifting food choices or change the distance traveled by shifting the amount of food consumed. It is a fun, easy to understand analogy that helps clients establish a more balanced diet. How Much Work? A Deeper Dive into Diet – Is an activity that explores the last concept in the Insulin Knife, handout which is the question “How much work?” Breaking this question into four key concepts: distribution of calories, portions, carbohydrate load, and the glucose-blunting effects of a mixed meal, understanding lifestyle change is easier to grasp. In addition, this activity reinforces why restriction isn’t the answer for long-term diabetes care. Food Choices – Teaching Activity will help your clients that are confused AND afraid to expand their food and eating choices. Food exchanges and “those lists” have been a staple of diet culture, and when your client is a chronic-dieter causality this fear typically comes from years of dieting (or trying to diet, but feeling like a failure). Chronic dieter, or the partner of a chronic dieter, need nonjudgmental, weight neutral, education about food and nutrition choices that focuses solely on how to nourish the body and not on weight or weight loss. Using Food Labels – Many clients have considerable confusion regarding how to read and interpret nutrition labels. There are many reasons for this confusion, the primary is the belief that there is a diabetic diet, that they must choose specific foods (typically diet), that they can only have specific foods (typically diet, low fat, calorie modified). These beliefs come from society’s obsession with restrictive eating and the surrounding diet culture, which targets type 2 diabetes. Hypoglycemia, Hunger & Fullness with Diabetes – This handout uses a hunger and fullness scale for diabetes care. This handout includes counseling dialog for clients who are at risk of hypoglycemia due to medication or may be experiencing hypoglycemic symptoms due to a poor diet. What About Weight? – Understanding the concept of weight neutrality is different than teaching this to clients. In this activity, you will explore how to help clients move aware from weight loss goals, and keep their attention clearly focused on behaviors that they believe are promoting health, blood sugar control, balance and well-being. Inactivity and Exercise Resistance – Inactivity & Exercise is a surprisingly complex topic to discuss with patients. This activity reviews three basic issues including: time management, benefits of exercise, and self-doubt about the ability to exercise/activity. Liver Sponge – Explaining Hepatic Glucose Release – Teaching activity explains how to teach and counsel a client to understand the Dawn phenomenon, Somogyi effect, Exercise and Alcohol and the role of the liver in diabetes care. Emotional Eating and Disordered Eating in Type 2 Diabetes – Prior to developing type 2 diabetes may have a history of disordered eating, due to dieting or have a previous diagnosis of an eating disorder. In this activity learn how to unpack emotional eating with diabetes in a compassionate, weight neutral way. Looking for more weight neutral, mindful eating resources for your clients? The second edition of Eat What You Love, Love What You Eat with Diabetes offers your client’s a step-by-step way to bring compassionate self-care to the meal.